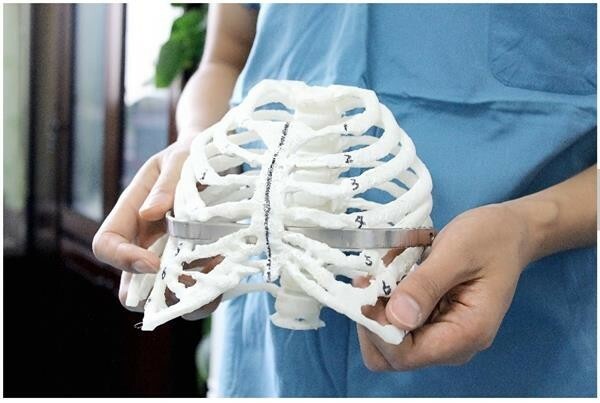 "...doctors in the TangDu Hospital of the fourth Military Medical University in Xi'an city, Shaanxi province, China, have recently and successfully completed a complex pectus excavatum procedure in which a 3D printed titanium alloy plate was implanted into a young girl’s chest all. It was the first time 3D printing technology was used in such a rare and complex surgery, that absolutely requires a customized approach. In short, it was nothing but a major breakthrough. The patient in question was the 18 year old Xia Ling, from the Shanxi province, a student who had recently finished her entrance examination for the University of Medical Science (majoring in clinical medicine). Unfortunately, she had been suffering from chest wall deformities since she was a child, resulting in severe pectus excavatum, spine scoliosis, left thorax are concave, and right thorax convex. In her case, the Haller index for pectus excavatum is 6.76, with a funnel being about 15cmx15cmx6cm in size and 45 cm3 in volume. ‘The patient's chest wall deformity is very serious, with the chest 'hole' being as big as a bowl,’ explained Thoracic surgeon Huang Lijun, who is Deputy Director at the hospital. She had previously undergone two deformity correction surgeries, which both failed.